S. – Recently it seems like the films we have watched have contained a push to view the larger world around the story being told. Letter from an Unknown Woman felt entirely the opposite. Rather than a comment on society the film is an intimate deconstruction of an unbalanced relationship. The action begins with danger and confusion surrounding the dapper leading man, although the ambiguity doesn’t last for long. With the delivery of a letter the director takes firm control of the viewer and delivers an engrossing reveal of how Stefan (Louis Jourdan) finds himself threatened with a duel at dawn. While the overall premise of the film is rather outrageous, the blend of wonderful shooting and an ethereal performance by Joan Fontaine as the love-struck Lisa had me willingly suspending my disbelief. There are many tightly framed shots of the obsessed heroine that subtly reflect her unwavering focus on the object of her affections. Somehow an atmosphere is achieved of innocent devotion that doesn’t stray into creepiness (well maybe momentarily when she is waiting for him to notice her one evening out on a snowy street) that is brilliantly undercut by the worldly and blithe Stefan. Maybe it’s just an artefact of the glamourous surrounds, but crazy never seemed so appealing. J. – You really don’t think it strays into creepiness, S.? I agree wholeheartedly that Fontaine’s performance does a rather miraculous job of stripping away your disbelief — and we definitely must talk more about that performance — but she is super creepy in her obsession with Stefan. She hides in the shadows outside his door and gives one of the most awesomely crazy looks of adoration when he is playing piano at a restaurant. But I see what you mean about the appealing part of the equation, as Louis Jourdan’s performance as Stefan is also a masterful one, making him utterly charming and fun, even though the viewer knows all too well that he is a scumbag. But before we dive into the performances I wanted to get into those tightly framed shots you mentioned. This is a very strange film in that regard. Most costume dramas tend to be expansive — big, elegant sets and choreographed crowds in period clothing. Letter from an Unknown Woman has those opulent locations and fantastic outfits, but it always keeps itself at a deeply personal level. There are a number of shots that are framed through windows and between curtains, images that constantly separate Lisa and Stefan from the rest of Vienna (and occasionally from each other). I think particularly of a great scene late in the film with Lisa and her husband Johann (Marcel Stauffner) chat in a carriage about her continuing obsession with Stefan. The pair are fashionably attired and exquisitely filmed in general (I mean the movie has amazing cinematography start to finish), but Ophüls does this neat trick of tightly framing Lisa in such a way that she just becomes a vision of white in front of utter blackness. The carriage and the city seem to disappear and absolutely everything becomes about Lisa and her obsession. This perfect framing is amplification enough, allowing Fontaine to keep herself calm and reined in — we don’t need hysterics to convey the depths of her desire and turmoil. Because let’s face it, S., this is a super melodramatic movie — like, super–super — but it is never histrionic, which is amazing. 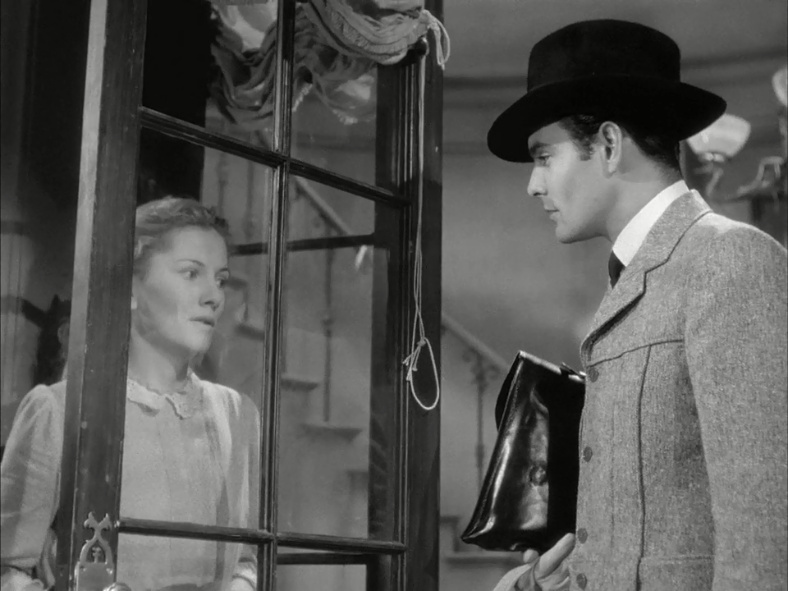 Joan Fontaine’s Lisa is ostensibly in a carriage at this moment, but Ophüls’ decision to place her in a sea of black isolates the character from the larger world and places the whole of the focus on her internal struggle. It also does a nice job of highlighting how grand and glamorous she has become since the early scenes of the film. S. – The histrionics may be absent but the intensity is ratcheted up to 10. Lisa’s steadfast confidence that she understands the depths of Stefan’s heart and can see the great man he has the potential to be builds a heavy tension. It illustrates an intriguing aspect of romantic love that is not often addressed, that is, what if you are wrong? What if the object of your heart’s desire is just a rogue that you have spun a fantasy around? Stefan’s personal situation also examines the murky, although probably more well-trodden, ground of the celebrated talent who feels he is a fraud. The desire to sedate himself with the pleasures of the high-life rather than face the void he feels within also makes him insensitive to the emotional lives of those around him. These tight shots skillfully signal the disconnect both of the main characters have with the larger world around them. During the brief phase where they are together both seem truly happy, to the point of being oblivious to the nuisance they cause wherever they go. Yet while the encounter is just one of many temporary diversions for Stefan, it validates and sustains Lisa on a path of self-destruction. I almost want to describe it as a humble tragedy, as would befit a tale of unrequited love of a simple girl for a celebrity, yet the stakes for Lisa get incredibly high without her seeming to notice it. J. found this moment particularly creepy, but it speaks to the power of Fontaine’s performance. Lisa is a very quiet character, but Fontaine gets a ton of mileage from her physical bearing and mute expressions. It is mind-blowing to contrast what Fontaine brings to this film with the torpid and tepid acting of her sister Olivia de Havilland in the much more famous Gone With the Wind. J. – The movie definitely avoids well-trod territory in telling what is ultimately a very familiar story, in no small part because it does run with this mode of quiet intensity. Pretty much any other film dealing with these matters — a woman obsessed with a man who ignominiously abandons he and an artist struggling with his abilities — would be overwrought in the extreme, but I’m not so sure there is even a single raised voice in this film. But even if a movie had decided to go the route of muffled emotion or (more accurately in this case) simmering longing, there would be that moment of teary catharsis. There would be the confrontation or the “why me?” moment — there would be the colorful burst of emotional release or the heightened tragedy of destruction through unhealthy desire. But not Letter from an Unknown Woman. The tension is always tightly coiled, but the film never once allows it to be released, which works shockingly well despite the very real possibility that the lack of catharsis could lead to an anticlimax. I think there are two things in the movie’s favor that prevent this anticlimax from happening. The first is that the film does fulfill the rules of melodrama with regard to its plot. The heroine makes the crushing realization that the object of her obsession is actually a douchebag and she suffers a tragic death by illness. The cad finds himself likely confronting death in a duel, done in by reading the titular letter rather than fleeing the conflict to come. So those endings that are consistent with tragedy and fatalistic storytelling are all there to satisfy on a strictly narrative level, but the film chooses to explore these over-the-top tropes in a measured and soft-spoken way that is ultimately all the more devastating by being so quiet and earnest. But none of that would matter without the second factor: compelling performances that sell it all so handsomely. What did you think of our two leads, S.? Ophüls’ Vienna is a strangely artificial world — not that the sets look fake or anything. It is more that the director constantly draws attention to the staging of the scenes. Normally this would be distracting, but in this case it works well to isolate the characters, forcing the viewer into an almost voyeuristic position. Perfect for a story of obsession. 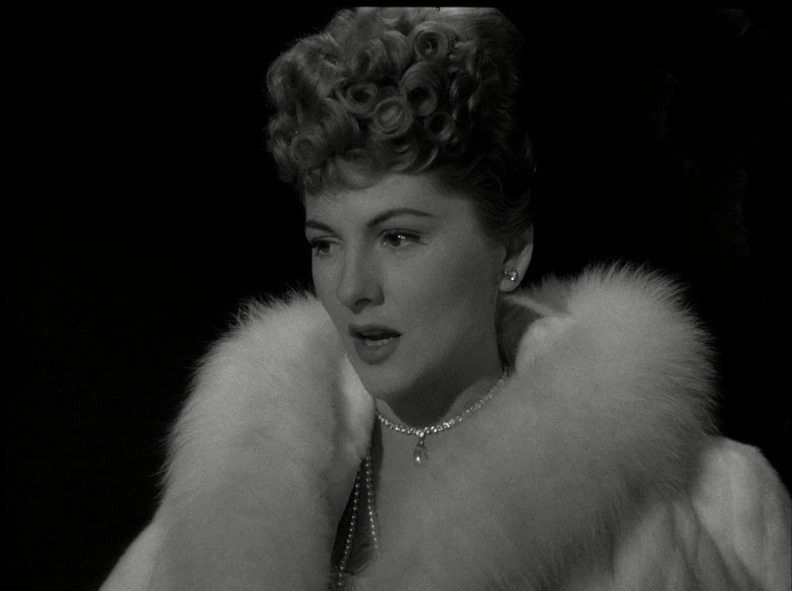 S. – The leads are both outstanding, in particular I am awed by Joan Fontaine. Thinking through the Lisa Berndle story arc afterward, it is amazing to me that she kept it on a believable plane throughout. From the innocent girl to the sophisticated wife and mother, Fontaine nailed it. I was thinking about that old adage that a crazy person never questions their own sanity and she definitely kept Lisa on the rails throughout. I have to add my agreement to yours, J., that the quiet moment where she realises that she was wrong about Stefan is exquisitely painful, so much is said with her quiet withdrawal from him after she has irrevocably damaged her home life. Jourdan’s Stefan was the ideal foil to the innocence of Lisa. While so obviously a cad to the viewer the absence of malice alongside his obvious deficits allow him to operate as a genuine target for her affection even though he was so clearly an unworthy one. Based on the storyline alone I would have thought this film was not going to do much for me. However, the engaging performances, wonderful visual aesthetic and ineffable touch that kept this melodrama on the down-low made it one to remember. J. – I’m not sure I have much to add to that, S. I suppose I would only reiterate that this film definitely seemed to live well outside the story types that I find compelling, but it manages to be utterly engaging throughout. I’ve always felt their is no such thing as bad stories, only stories poorly told. But despite my insistence on the absolute truth of that rule, melodramas pretty much always repel me. 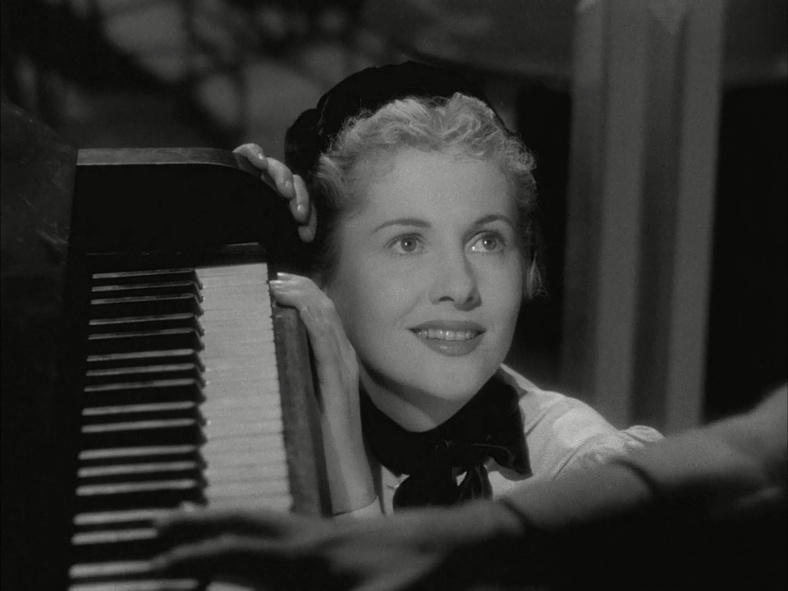 But Letter from an Unknown Woman is so quietly excellent and so powerful in its simplicity that I was won over within moments of Joan Fontaine’s first appearance on screen. This film is utterly confident of what it wants to be, and that comes across in every frame. 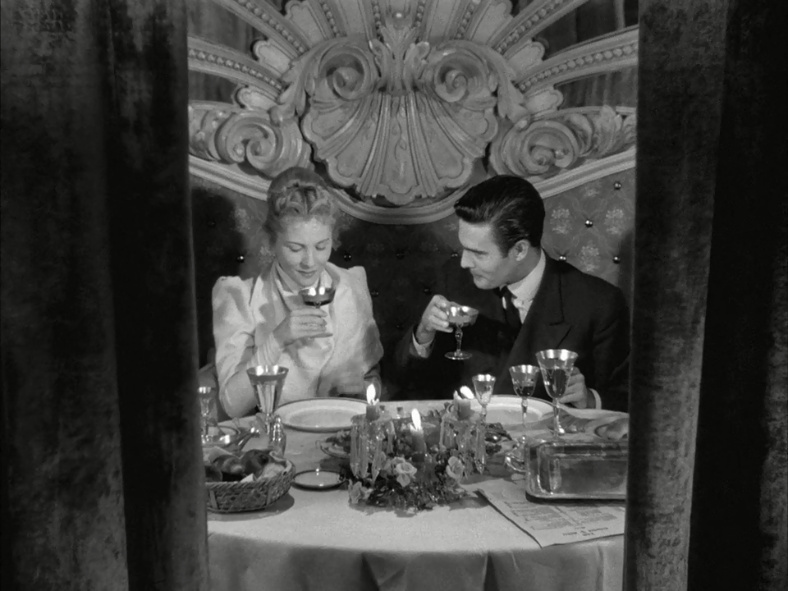 And it is particularly remarkable that Ophüls was able to create such a film in the cliché factory that is Hollywood. This aspect alone makes me very excited for his other Sight & Sound list movie, Madame de… (1953), which was filmed in the more daring film environment of France.